But if he was involved in a confidence trick, he was hoist by his own petard; among Trout Mask Replica’s many sins are its extraordinary length, and at 79 minutes it’s too long to play at record club. (Were it 35 minutes long I might have more patience with it.) So, as per Tom’s rules, I moved along to the next eligible record. 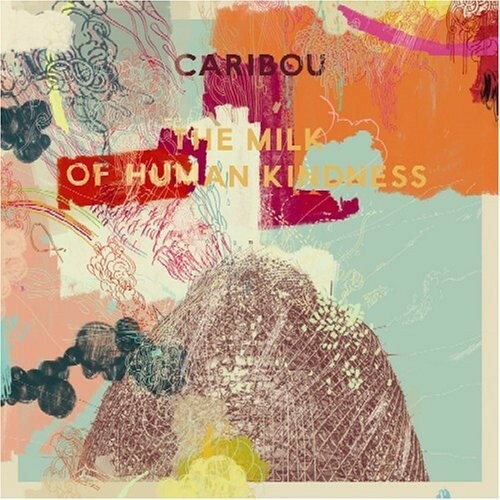 Which was Caribou’s The Milk Of Human Kindness. Sadly for Tom’s intentions, though, Caribou is exactly the kind of artist I would normally play at record club, although, to be honest, I’d never really considered bringing this record along, even though it’s something that got spun seemingly all the time when Emma and I first moved in together in 2007. Less frenetic than Up In Flames, less song-based than Andorra, …Milk… is still clearly the product of a laptop, an imagination, and a deep love of musical history, but it’s far happier to float in its own grooves and enjoy its own prettiness than most of Dan Snaith’s other work. I love it the way I’d love a chair or a coffee table; not with a deep emotional passion, but with a warm sense of comfort and aesthetic pleasure. It sits in the room engagingly but without being demanding, although you can easily immerse yourself in the complexities of what it’s doing if you so wish. I think of it as the record that made our first flat together start to feel like our home, and I associate it with our first cat, Bob, who sadly and suddenly died last week, because he was another key presence in gluing our domestic life together. Musically, there’s some of the woozy, distracted, pseudo-60s psychedelic pop that had antecedents on Up In Flames and would come to fruition on Andorra, but there’s also a hefty slice of krautrock-ish repetition, and almost minimalism at points (well, in comparison to the maximalism of Up In Flames. I don’t know where Snaith gets his drum samples (if they are samples), but he uses the same kind of tumbling, rattling, jazzy fills here that he has throughout his career. I don’t know how much of his music is assembled from samples and how much is played live – certainly when he performs live Caribou is a band, and things are reproduced by musicians onstage – but whatever the mix is, he has a unifying gestalt running through all the work he’s released under this name. A great record? I don’t know; a record I really like and have played an awful lot over the last nine years, that’s for sure. Interestingly, the evening before we met it occurred to me that I own a legitimate second C26, too; I keep digipaks and other unusually-packaged CDs in a separate run of discs, and the C26 from that part of the collection was Ornette Coleman’s The Shape Of Jazz To Come. I intended to bring this with me and give everyone an option of which to play, vaguely hoping that we’d plump for Ornette’s notoriously difficult free jazz opus. Sadly, though, I managed to pick up John Coltrane’s still jazz but much less free Giant Steps, which sits next to it and has almost identical packaging. So we played Caribou. Rob listened: Liked this a lot, which left me wondering about the problem I have with Caribou. Every time I hear them/him I enjoy it, but I’m never drawn back. I listened to ‘Swim’ a couple of times when it came out, before Nick brought ‘Andorra’ to a previous meet. I liked it well enough but found it an easy record to walk away from, as in literally to leave the room during. I never really got a grip of it. Then Tom and I found ourselves walking across a darkening field at the End of the Road festival and hearing Snaith’s touring incarnation of Caribou strike up ‘Sun’ on the stage we were passing. It sounded great, but we carried on to the bar and never headed back. I thought ‘Andorra’ was strikingly inventive when Nick played it for us. I’ve never gone back and listened to it again. ‘The Milk of Human Kindness’ struck me as even better, crammed with life and detail and touch and verve. I hope I will go back and spend some more time with it but on past performance I can’t promise. I’ll save you the long essay speculating on why we leave lying some records that we find really appealing. I don’t know the answer. Tom listened: I thought this was absolutely tremendous – better than I remember Andorra being on a first listen and much more realised and cohesive than my sole Dan Snaith record – Manitoba’s Up in Flames. Whilst I totally get what Rob is driving at (and that is precisely what has put me off exploring Caribou’s output more fully) I feel that The Milk Of Human Kindness would probably be the best place for me see whether Caribou is very exquisite, beautifully constructed and arranged window dressing or something deeper and more substantial.